CityWorks(X)po Florida Returns to Winter Haven for Third Year | Winter Haven Economic Development Council, Inc. 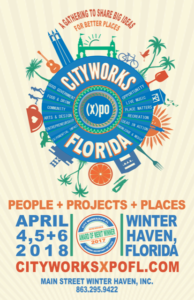 The third annual CityWorks(X)po Florida is coming to Winter Haven April 4-6, 2018, and this year’s lineup of speakers is sure to inspire attendees with thought-provoking presentations and engaging dialog. The evening schedule includes special networking opportunities and entertaining events. With generous enthusiasm and support from CityWorks(X)po founder Ed Walker, Main Street Winter Haven, Inc., is again partnering with the Greater Winter Haven Chamber of Commerce, City of Winter Haven, Winter Haven Economic Development Council and Visit Central Florida to bring you this placemaking summit, idea exchange and festival-style conference. 12:00 -2:00 pm: Check in begins at Grove Roots Brewing Co.’s The Packing House. 2:00-5:00 pm: CityWorks(X)po kicks off! 5:30–8:00 pm: Stay for beer, bites and live music! 7:30 am: Registration, coffee, juice and lite breakfast bites at Heartland Church. 9:00 am: Day 2 sessions begin. 5:30-8:30 pm: Live music, great food and drink at Gram Parson’s Derry Down. 8:00 am: Registration, coffee, juice and lite breakfast bites at Heartland Church. 9:00 am: Day 3 sessions begin. 12:00 pm: Wrap-up CityWorks(X)po Florida 2018. 1:00 pm: Sign-up for a boat tour on the Chain of Lakes. To register and to learn more about the (X)citing lineup of speakers, go to www.cityworksxpofl.com. If you would like to become a sponsor and help bring this innovative conference to our area, contact Main Street Winter Haven at 863-295-9422.